After slashing prices of the Ninja 300 itself, Kawasaki India has now slashed prices of the spares. 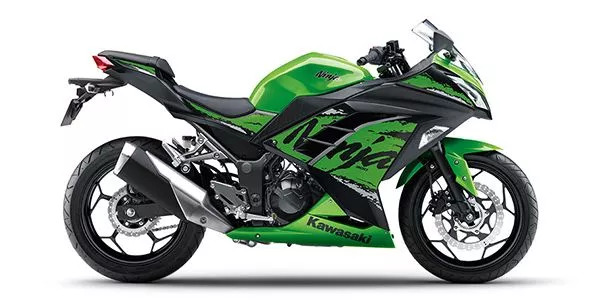 Back in July 2018, Kawasaki announced the much awaited launch of made in India, Ninja 300. The entry level sportsbike finally was being produced by company plant in the country. This meant, no longer CBU duties had to be paid, and thus resulting in a huge price drop. From costing Rs 4.4 lakhs on road, prices have now been reduced by about Rs 1 lakh. This has resulted in a huge increase in demand. Sales of Kawasaki Ninja 300 have grown almost 10 times. From selling 20-30 units in Dec 2017, Kawasaki India sold 220 units of the N300 in Dec 2018. Thus making Ninja 300 the best selling Kawasaki in India. With sales growing, many owners noticed that the price of spares was still high, same as before. Kawasaki India had promised to reduce prices of spares. They have now done the same officially. As per Anzen Kawasaki, authorized dealer of Kawasaki India, spares price of Ninja 300 has been reduced by up to Rs 47,000, or 1,355%. Full spares price details can be seen in the table below. Source – Anzen Kawasaki India. In terms of percentage, the highest decline has been noted in the price of front disc brake. This used to cost Rs 28,460 earlier; now it costs 2,100. In terms of amount, it is the Cowling which has seen the highest decline – reducing by as much as Rs 47,010. 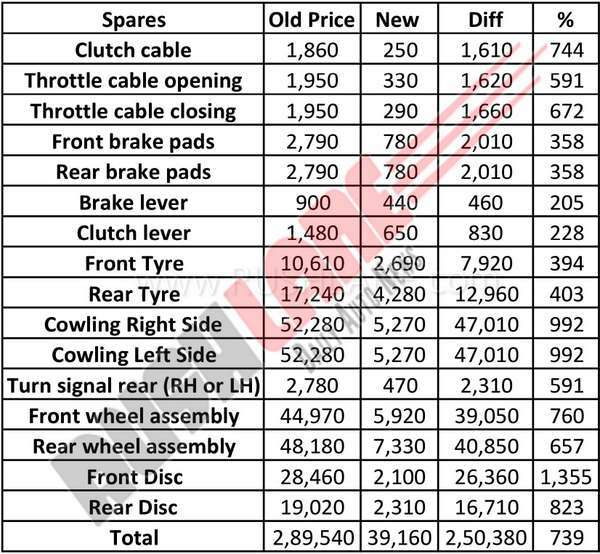 Clutch cable price has been slashed from Rs 1,860 to Rs Rs 250; Throttle cable price cut from Rs 1,950 to Rs 290; brake pads now cost Rs 780, brake level Rs 440, clutch level Rs 650, front tyre Rs 2,690, rear tyre Rs 4,280, turn signal indicator Rs 470, wheel assembly Rs 6-7k. This decline in prices of spares of Ninja 300 has left owners surprised, in a very good way. Kawasaki India, after splitting from Bajaj, has managed to take some really bold steps, which has only resulted in the better for the company. Their sales are growing, spare prices are coming down, and buyer sentiment is improving. Powering the Ninja 300 is a twin cylinder 296 cc FI engine which delivers 39 PS power and 27 Nm torque. Features include dual headlight setup, digital instrument cluster, dual ABS system, 17 liter fuel tank, 179 kgs kerb wt, 182 kmph top speed, etc.